We may have come to know a great deal about Bosch’s imagination and his imagery, but we know precious little about the man. It is thought that he was born in about 1450, and, although we know that he was buried on 9 August 1516, we do not know the date of his death. Georg Braun and Frans Hogenberg, Panorama of ‘s-Hertogenbosch (1572), in Civitates Orbis Terrarum, Band 1, 1572 (Ausgabe Beschreibung vnd Contrafactur der vornembster Stät der Welt, Köln 1582), Universitätsbibliothek Heidelberg, Germany. Wikimedia Commons. He spent much of his life in the small North Brabant city of ‘s-Hertogenbosch, known today more commonly as Den Bosch. Over the period of his life, the city was flourishing, although when he was still a boy, in June 1463, about 4,000 of its houses were destroyed in a catastrophic fire, an event which surely lived vividly in his memory. 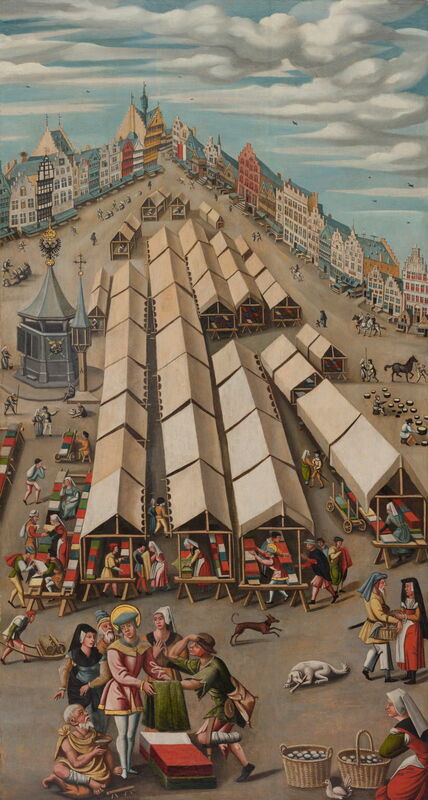 Unknown, The Draper’s Market in ‘s-Hertogenbosch (c 1530), oil on panel, 126 x 67 cm, North Brabant Museum, ‘s-Hertogenbosch, The Netherlands. Wikimedia Commons. Bosch came from an artistic family: his grandfather, who probably died when Bosch was still a young child, was a painter, and his father provided artistic advice. 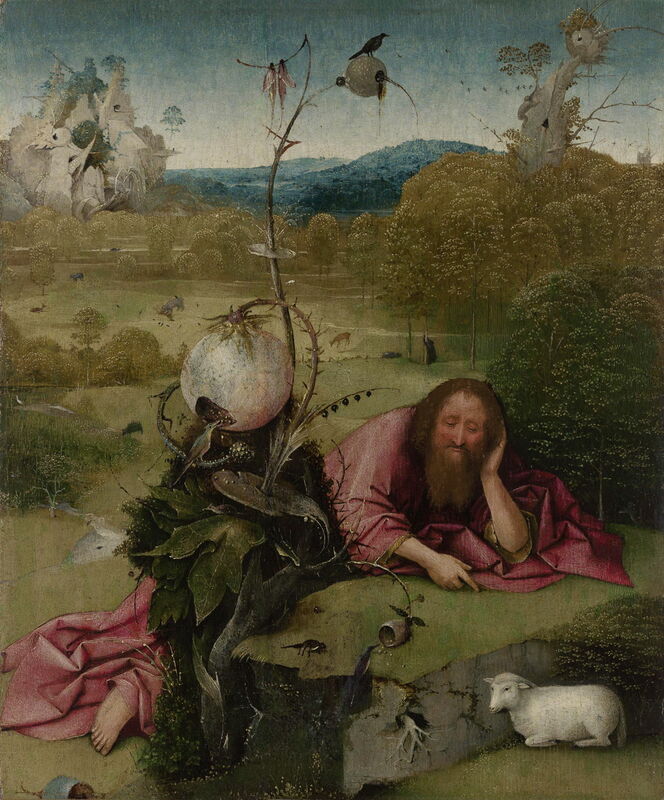 Bosch’s name at birth was Jheronimus van Aken, usually shortened to the familiar Jeroen or Joen, but he signed several of his paintings using the assumed surname of Bosch, by which he has been known ever since. He had two sisters and two brothers, both of the latter becoming painters. 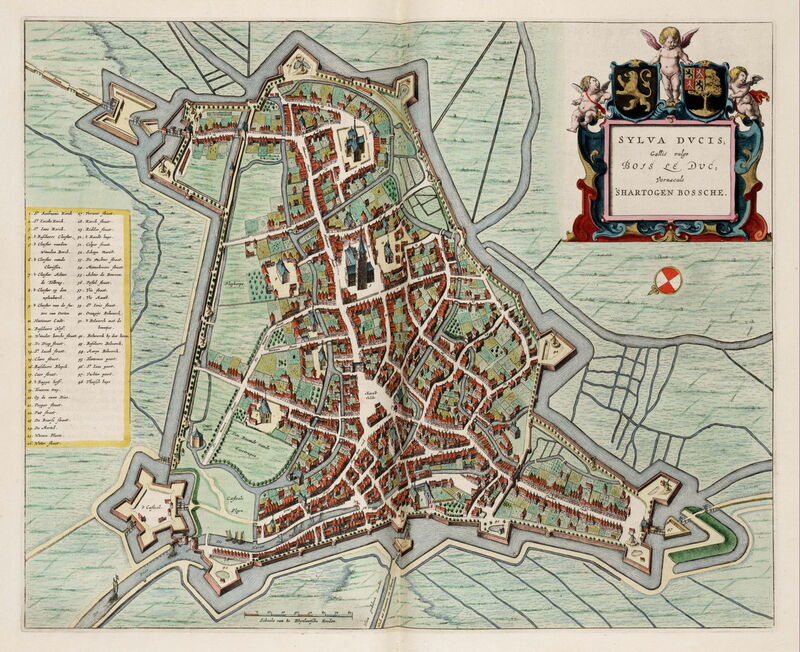 Joan Blaeu (1596–1673), Map of ‘s-Hertogenbosch (1649), in Atlas van Loon, further details not known. Wikimedia Commons. Although it is usually assumed that he was taught to draw and paint by his father and/or uncles, there is no evidence to support that. Bosch married, sometime between 1479 and 1481, an older woman, Aleid van de Meervenne, from a wealthy family. At first they lived in one of the better properties on the main square in the city, but later lived in an inherited house in the nearby town of Oirschot. The couple had no children, and Aleid outlived him, dying in 1522 or 1523. In 1487-8, Bosch was sworn into the elite inner core of the conservative religious group of the Brotherhood of Our Lady, which included forty of the most influential citizens of ‘s-Hertogenbosch with several thousand supporters elsewhere. Some have proposed that Bosch visited Venice at some time during his working life, and that may account for the small concentration of his works to be found there. This remains extremely controversial, and lacking in direct evidence. Hieronymus Bosch (c 1450–1516), Saint John the Baptist (c 1490-95), oil on oak panel, 48.5 × 40.5 cm, Museo Fundación Lázaro Galdiano, Madrid. Photo Rik Klein Gotink and image processing Robert G. Erdmann for the Bosch Research and Conservation Project, via Wikimedia Commons. 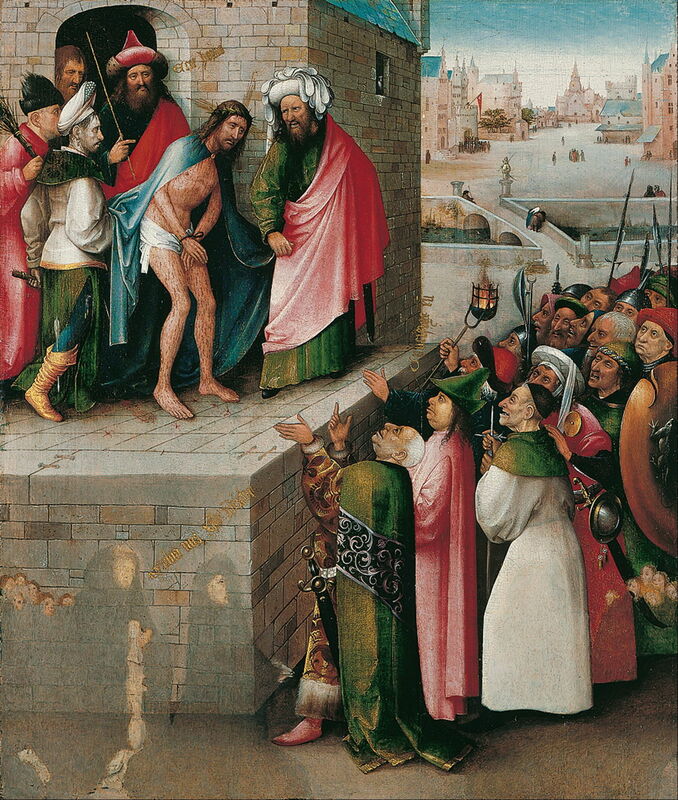 Few of Bosch’s paintings are known from recorded commissions. In about 1495, a wealthy Antwerp merchant, Peeter Scheyfve, commissioned The Adoration of the Magi Triptych (now in the Prado), which includes his and his wife’s portraits as donors. 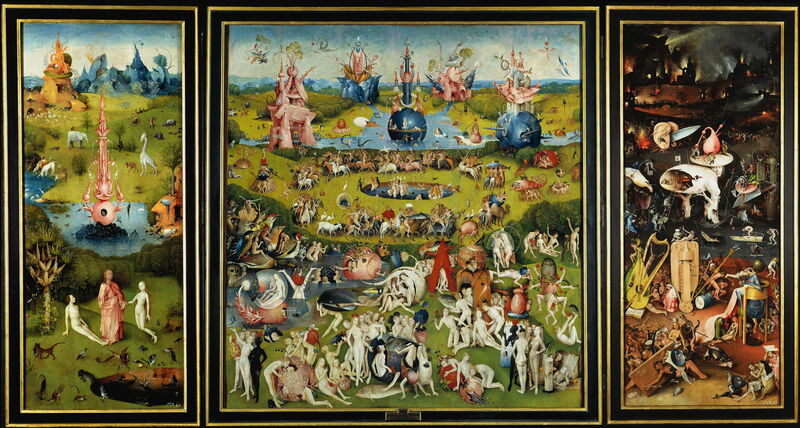 Bosch’s best-known masterpiece, The Garden of Earthly Delights, is thought to have been commissioned by Engelbert II or Henry III, as Count of Nassau-Breda, in about 1500. This was followed by an order for a Saint Anthony triptych by Hippolyte de Berthoz, before his death in 1503. Hieronymus Bosch (c 1450–1516), The Garden of Earthly Delights (c 1495-1505), triptych, oil on oak panel, 220 x 390 cm, Museo Nacional del Prado, Madrid. Wikimedia Commons. 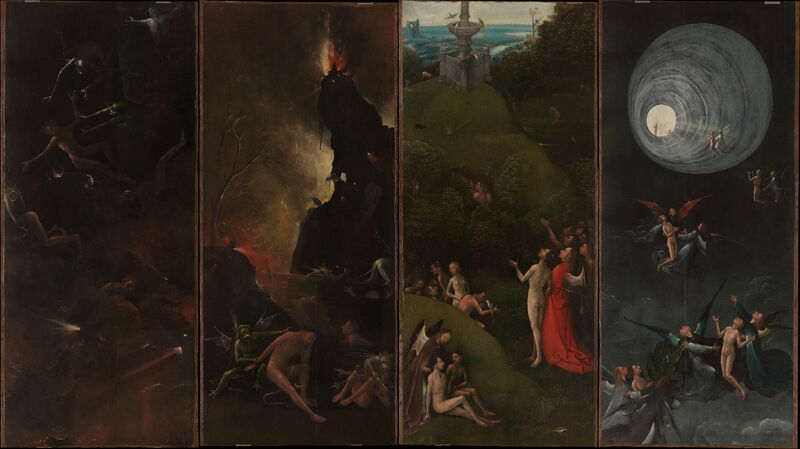 In about 1504, it is believed that Duke Philip the Fair of Burgundy commissioned Bosch to paint a large version of The Last Judgement, but that does not appear to have survived. 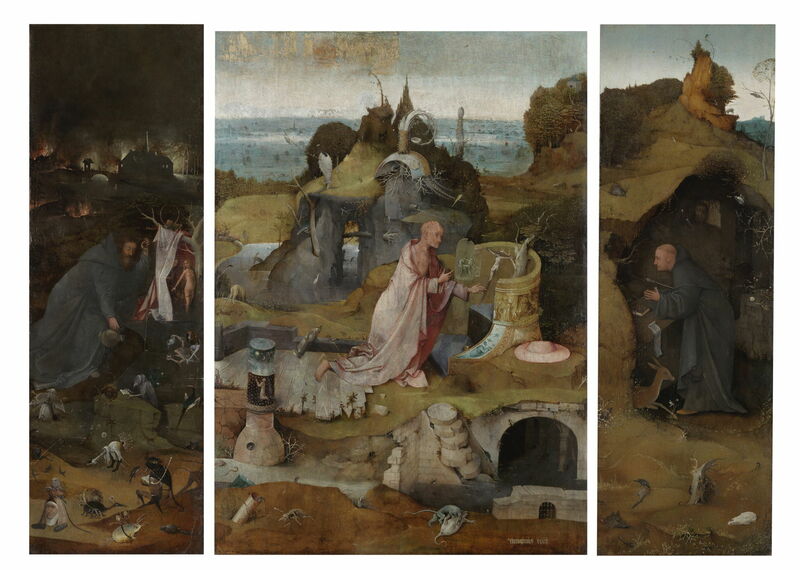 Hieronymus Bosch (c 1450–1516), Visions of the Hereafter (1505-15), oil on oak panel, four panels each approx 88.8 x 39.8 cm, Museo di Palazzo Grimani, Venice. Photo Rik Klein Gotink and image processing Robert G. Erdmann for the Bosch Research and Conservation Project, via Wikimedia Commons. 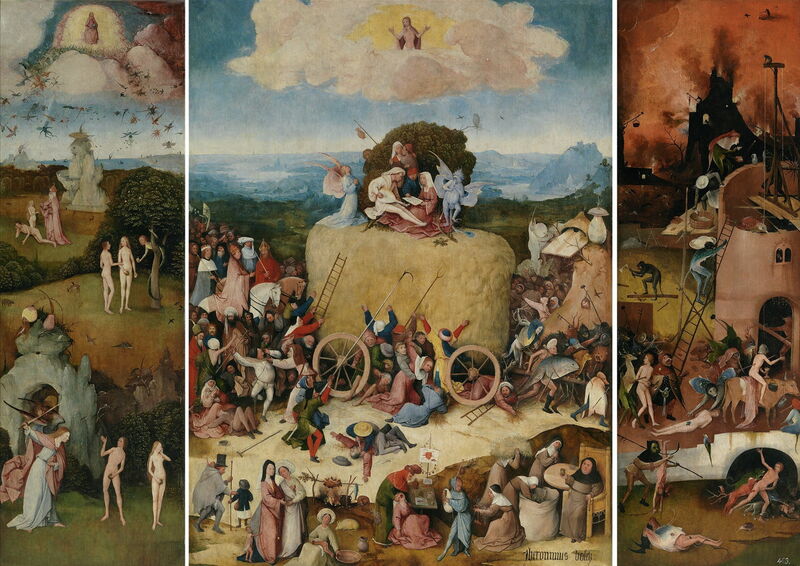 Hieronymus Bosch (c 1450–1516), The Haywain Triptych (c 1510-16), oil on oak panel, left wing 136.1 x 47.7 cm, central panel 133 × 100 cm, right wing 136.1 × 47.6 cm, Museo Nacional del Prado, Madrid. Wikimedia Commons. Bosch died in early August 1516, probably a victim of an epidemic which swept through the city that year and the next, causing many deaths. His work was widely admired in several of the court circles of Europe, and remained popular for the rest of the century. His paintings were collected by members of the Burgundian-Habsburg court of Duke Philip the Fair, and were dispersed into Spain and Venice. Many have speculated how Bosch’s unique images came about, and there are lengthy and detailed accounts which link elements to sources such as miniatures of the 1400s. I have not seen explanations of some of the optical peculiarities, best exemplified by his use of multiple scales (huge birds and fruit, for example), and the extraordinary tunnel in his Visions of the Hereafter. I believe that they are evidence that Bosch suffered from classical migraines. Many of those who suffer from migraines undergo the full triad, of visual aura, headache, and nausea/vomiting. Tunnel-like structures are not an uncommon component in visual auras, and are often intensely bright at their far end. A less common effect of the visual disturbances which can occur during migraines is loss of relative scale, a factor claimed to have been important in Charles Lutwidge Dodgson’s imagery in his Alice books. Bosch was clearly fascinated by the macroscopic appearance of fruit, plants, and other objects. A century later, with the development of much improved optical instruments including the microscope by Antonie van Leeuwenhoek, it would have been easy to attribute those to Bosch’s use of magnifying lenses. But the lenses that were available around 1500 are unlikely to have been sufficient to inspire such imagery. Falkenburg R (2011) The Land of Unlikeness: Hieronymus Bosch, The Garden of Earthly Delights, WBOOKS. ISBN 978 9 040 07767 8. Fischer S (2013, 2016) Hieronymus Bosch, The Complete Works, Bibliotheca Universalis, Taschen. ISBN 978 3 8365 3850 3. Matthijs Ilsink, Jos Koldeweij et al. (2016) Hieronymus Bosch, Painter and Draughtsman: Catalogue Raisonné, Yale UP and Mercatorfonds. ISBN 978 0 300 22014 8. Schwartz G (2016) Jheronimus Bosch, The Road to Heaven and Hell, Overlook Duckworth. ISBNB 978 1 4683 1373 4. Posted in General, Life, Painting and tagged 's-Hertogenbosch, Bosch, history of painting, migraine, painting. Bookmark the permalink.